Since 2013, Brooks Resources has granted public access on its private property via the IronHorse Trail. 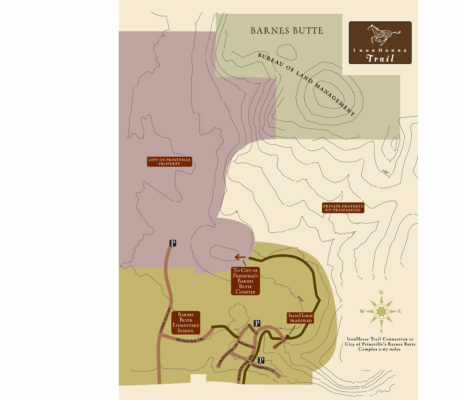 Since then, the trail has been a popular recreational trail for many in Prineville, and provided unprecedented access to Barnes Butte and public lands. Brooks Resources has recently sold the eastern portion of its property to a private owner. Over the last few weeks, Brooks Resources has been working on a new trail connection to replace the former IronHorse Trail and to provide an easy route for guests to enter the new Barnes Butte Complex. Combined with BLM land, The Barnes Butte Complex is over 620 acres of open space and provides the public expanded access to Barnes Butte and an extensive recreational trail system. This great asset to the community is a wonderful opportunity for the public to get out and enjoy public lands, close to home. Our updated trail map shows the new property boundaries and connection locations. New trail signage will be installed soon. We invite you to explore the scenic vistas and high desert landscape that makes our environment so beautiful and unique. This entry was posted in Prineville. Bookmark the permalink.